This has been such a trying time for you. You have handled it as you always do, with strength and compassion and caring for your loved ones. You are the one who is faced with such a great challenge physically, mentally, and emotionally, but yet you continue to worry and care for others close to you first above yourself. You have taught me so many things about what it really means to be a man, a good friend, a good father, a good partner, and about how to lead a good life in general. I know I have told you some of these stories before and how much of an impact they’ve had on me, but they bear repeating. You have molded me into the man I am without even trying just by being yourself. That is the thing about integrity, devotion, commitment, perseverance, sticktoitiveness, persistence, and a never give up attitude. These are not things taught like numbers or the alphabet. They are things learned by watching others you chose to emulate. I was lucky grow up around people who had these traits in spades. Another time when I was in 6th grade and struggling because it would take me 5 hours and sometimes longer to get through my homework each night, you showed me once again the meaning of fairness, courage, and just how much you loved me. I was in Mr. Delmuto’s and Mr. Goldberg’s pod class. We had obnoxious amounts of homework each night. We had to read an entire book every week of the school year and do a report on it. Gone With The Wind at 1,024 pages was counted as 4 books. Yes, I had to read Gone With The Wind in 6th grade in one month with all my other schoolwork as well. I HATE Gone With The Wind! I had to recite a full usually lengthy poem every Friday morning straight from memory. We had countless pages of English homework where we were to just label ALL the words in every sentence. Many times it would take 20 pages with 20 sentences per page with 10-20 words to sentence. That is 6,000 words to be labeled! There were countless math problems that were all the same. We had to write a 30-page term report and give a 45 minute oral presentation on it to the class. We were 12 years old. It was like teaching by punishment. They mistakenly approached teaching like training for a Marathon. Where the body thrives from exercise and nourishment, these kids minds were learning to hate learning and being gratuitously asked to perform an action they clearly had already learned and perfected. I would always finish all my assignments even though many students would not. I felt it was my duty to fulfill what was asked of me and was required completion of the tasks. I was cracking under the workload and you could see it. Here is what you did. One night after dinner when I usually worked on my homework, a task usually done between 6 pm and 10 or 11 pm, you told me to go have fun and that you were doing my homework that night, ALL OF IT! You wanted to see just how long it would take a grown educated adult to finish the assignments, that you wanted to make sure this was just not a case of my being slow or exaggerating the difficulty. It took you 4 and a 1/2 hours. You scheduled an appointment the very next morning to speak to Mr. Delmuto at lunch that very day. At your lunch meeting at the school in his classroom when all the students were in the cafeteria, Mr. Delmuto started by opening the whole class’s grade book. He showed you how I was one of his top students and that I was excelling and doing very well. You responded calmly by asking him a few questions. You asked him if he personally gave out all the assignments. You asked him if he personally checked everyone’s assignments in the entire class to make sure they had been completed. You asked him if he personally gave out all the answers to all the assignments. You asked him if he personally administered the questions to each student individually to see if they had read their weekly book. He answered yes to all these questions and more. Then in a manner that I know well (even though I wasn’t present I can picture well), you asked him directly how he had any time to actually teach if all he was doing was administering assignments and checking to see if they were done. You told him you would rather your son learn and have a fun balanced life as a child. You told him you did all of my homework the night before. You told him it took you 4 1/2 hours. You said that if the price for success in his class was no time for fun than you would prefer me to be a poor student in his class. He had no response. He was speechless. The meeting ended. He told you that for the remainder of the year I should only complete the portion of each assignment that I deemed enough to firmly understand the material and then no more. I would only be graded on the portion I completed. I got straight A’s the entire year. You taught me that although someone is in a position of power, that doesn’t always make them right. You taught me to be respectful, but to always stand up for myself and challenge authority when I believed something to be wrong. I think Mr. Delmuto was scared of you too especially because you wore an all white suit that day with sun glasses into the school for the meeting and all the kids started a rumor that you were in the mafia because of it… that and also the fact that from that day out, they all saw that Boudwin only did the homework that he wanted to do. There are so many stories I have like this as to how you helped me become a good man. They are all examples of you just acting as you would naturally without trying to even teach. You epitomize the concept of leading and teaching by example. I will share the rest of these stories with you over the coming years as you mend and continue to thrive. Although you are currently physically weak, you will have a lung soon. This will bring a whole new set of life challenges with it which will undoubtedly make you stronger because of it, showing me the true meaning of strength, character, integrity, devotion, and commitment once again. Thank you! You are the best man I know and I and so many others love you so much. As many of you know who are close to me this has been the most trying time in my family’s life. I want to say THANK YOU to so many of you for your well wishes & prayers which have come in the form of calls, texts, emails, visits & personal prayers. I’m happy to report that through your support and my Father’s never give up persistent & resilient attitude his DOUBLE LUNG TRANPLANT surgery which took place yesterday was a COMPLETE SUCCESS! In true form my Dad is already ahead of schedule and headed towards re-cooperation and rehabilitation. He was conscious 10 hours after surgery even though he wasn’t expected to be until 24 hours after. The breathing and feeding tubes have been removed and he is breathing on his own and he has had several short walks. The doctors here have been AMAZING both from a talent perspective & a compassionate stand point & have given me pause to believe that miracles really do happen being that 2 & 1/2 weeks ago I rushed my Dad to the ER and things were pretty touch and go for a while. The doctors saved my Dad’s life. My family is most grateful to the donor and their family for the AMAZING gift of life that they gave my Father and several others. We greatly mourn the donor and donor’s family’s loss while simultaneously REJOICING in my Father’s new lease on life. If you have not indicated yourself as an organ donor, please consider it. One terrible tragedy can be salvaged to create several miracles. The Lung transplant re-cooperation and post TRANPLANT life is not easy and a strict regiment must be followed, but my Father is the strongest man I know and he has the unwavering support of his immediate and extended family and will persevere! A year and a half later we found out that the young man who’s lungs resided in my father and saved his life were that of 22 year-old Ian Heidemann. Ian tragically passed in a car accident on Valentine’s Day night 2012. I get overwhelmed thinking about it to this day. Amy and I married a week ago today on the 3-year anniversary of Ian’s passing and my father’s life saving transplant. My Dad had been suffering from a degenerative and terminal lung disease called IPF that has no known cure or treatment. He had been battling it for 4 years when things started to get worse the summer of 2011 and started to rapidly degenerate from that point on. The only thing that could be done to help was a lung transplant. It is not easy to qualify as organs are in high demand and short supply. Patients need to be sick enough to significantly benefit from a transplant, but not so sick that the transplant won’t make a big enough difference if there are other problems. Doctors want to ensure that organs go to those who can benefit most. After the first of the year, my Dad got really bad when the disease start to take hold even more so and he was place on 24 hour oxygen and pretty much confined to my mother’s and his home. IPF many times includes a slow degeneration and then a rapid fall off in just a few months or even weeks. That is what was happening to my father. Doctors at Methodist hospital began the process of evaluating whether he was a lung transplant candidate in mid January and had further test scheduled for February 13th, 2012 to make a final determination as to whether he could be on the transplant list and just where his need/rank would be on that list. Unfortunately and fortunately he did not get to do those tests on February 13th. On February 2 I brought my twin boys Jack and Luke to visit my parents for the day and as soon as I entered the house realized things were critical. My Dad could barely get out of bed with oxygen cracked all the way and assistance. He could not get through an entire sentence when speaking. We would come to find out later that the disease had significantly taken hold deteriorating what little was left of his lungs and was compounded by a severe case of pneumonia. After some discussion, I convinced my father to let me call his doctors and speak to them about the current situation. His blood oxygen levels would drop into the low 70s and even at times the 60s when he would do anything other than lay in bed. I quickly learned form the doctors that oxygen levels like that are critical and everything from heart attack to stroke to other organ failure is an immanent risk. I needed to rush him to the ER immediately. He could not even make it to the car with assistance and oxygen without having to stop to sit in a chair just 15 feet from the car door. After spending some time in the ER my father was admitted to the IMU (just one level below the ICU) where he spent a week receiving high doses of steroids and antibiotics as well as other medications while being bed ridden. Doctors saved his life that day. They said that if he hadn’t come in then, there was a good chance he could have died. After the pneumonia cleared, he was out of immediate (that day and the next) danger, but they told me without a lung transplant he only had a couple of months. Doctors at Methodist were amazing! They were both highly skilled experts as well as compassionate human beings. Within 7 days my father was on the transplant list in the second position. A week after that on February 15th, 2012 my Dad received a successful double lung transplant that saved his life and will, God willing with continued recovery allow him to see his grandchildren grow up and continue to dance to the Beach Boys with their Pop-Pop:) My point in writing this story is to let you know that my father would be dead right now if it weren’t for the amazing gift of life that a generous organ donor made and decided in advance. Through one tragedy that my family greatly mourned and still morns, a wonderful miracle was made possible and my father lives. Please consider being an organ donor. If we all were organ donors, then the 18 people per day who die in our country waiting for organs lives would be saved, they wouldn’t die. Thanks in advance for your thoughtful consideration and for reading my Dad’s story. Please visit lifegift.org to register NOW! NICKELS, DIMES, QUARTERS, OR DOLLARS FOR MILES benefiting Life Gift and their mission to get everyone to say yes to ORGAN DONATION. I have set a goal of running 250 miles during the month of January. With your support I’d like to use this as an opportunity to raise more money for Life Gift and to raise awareness about organ donation. Sponsor me by simply commenting to this post if you don’t mind your donation being public and designate how much you’d like to pledge per mile NICKEL, DIME, QUARTER, OR DOLLAR(S) for you big dogs). If you want your donations to be private, please just send me a private Facebook message with your donation amount or email me direct at robert@theanonymouscelbrity.com. For as little as a nickel per mile or $12.50 total (or possibly less if I don’t run all 250 miles, but I wouldn’t bet against me;) you could help save someone’s life. At the beginning of February I will contact each of you independently regarding your total donation based upon the total January miles ran and all check will be made out to Life Gift directly and mailed to me so one lump donation/delivery can be made. All donations are tax deductible and receipts will be issued to you. LIKE ME? Then help me raise money for this very worthy cause, save lives, and prevent needless deaths. DON’T LIKE ME? Punish me by making it so valuable for me to run extra miles that I brutalize myself doing it. Either way, you WIN;)! Today is the 2nd day of January and the New Year and I have 23.1 miles under my feet already. I just knocked out a half marathon this morning after last night’s 10 miles. I’m feeling a little sore in the quads and the groin, but nothing some motivation to help and worthy cause can’t help me power through. SURREAL… That is the only word that comes close to mind when asked about this moment. Your father is on death’s door which seems like it has been a slow unavoidable journey to despair and all of a sudden he is on the transplant list after you rush him to the hospital a week before hand. Next thing you know he is getting the transplant that will save his life should it be successful. What is the one thing I remember more than any about how he responded in the early morning hours of February 15th when my mother, brother & I were huddled around his bed awaiting news about final go ahead? He cried. We asked, Dad are you OK? He responded, “Someone had to die for this chance for me.” Fast forward to today. The Heidemann’s were nothing short of amazing people! My family with me at the times including: my Dad Paul, Mother Donna, Brother Paul, Sons Luke & Jack, Girlfriend Amy and her Daughter Ashley were dressed ready to meet the President because these people were more important in our minds. We entered the boardroom at the Life Gift offices in Houston solemnly and with quiet reverence and nervous energy. After watching a video that one of Ian Heidemann’s friends had made and posted to YouTube over a year ago about his gift which was set to my favorite movie of all time’s music and supporting clips about how Ian gave the gift of life this past Valentine’s Day, I lost it. When I met Rob and Janis and shook their hands I started to dry uncontrollably imagining but not knowing the pain of what it must be like to lose a child especially being a father of twins in the room myself. Rob grabbed me and hugged me. A man I had never known before 10 minutes ago was consoling me about the loss of his son, a young man who I had never met and would never meet. His mother kissed my cheek. He told me that meeting us didn’t hurt more. It hurt less. It gave him and his wife Janis a way to feel like Ian was still with them and gave them further closure. I was speechless at both of their ability’s to help us through our, although not newfound, but now real grief with a face and name that had also given us a second chance. I introduced my twins. We all became instant family. I don’t know how Rob and Janis summoned up the grace and power to do that, but it forever changed my life and set an example for me of how to LIVE! Thank you Rob & Janis. There is an out of this world quality to watch a man and his wife listen with a stethoscope to their son’s lungs inhale and exhale in your father’s chest. That image is forever seared into my mind. 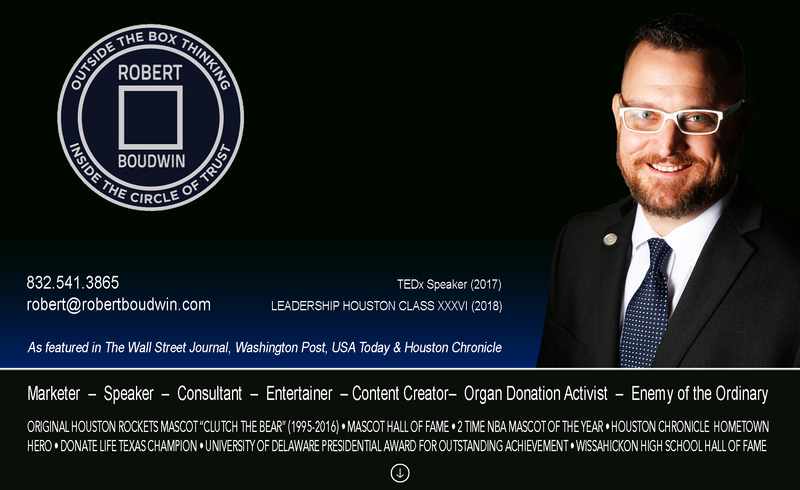 On January 19th, 2014 I will be running the Houston 1/2 Marathon “In Full Gear” as Houston Rockets mascot Clutch the Bear with a T-shirt and matching head band promoting organ donation and the official web site to sign up, donatelifetexas.org. An organ donor saved my father’s life. That donor’s name was Ian Heidemann. He was an amazing young man who’s generosity of spirit, selflessness, and forward thinking saved six lives. If you’d like to help support my run, we have matching shirts (identical to what I will be wearing in the race) available NOW for a $50+ donation to Life Gift and their mission & awareness campaign to get everyone to say YES to organ donation. You can donate and join TEAM CLUTCH through the attached link. No donation is too big, so if you’d like to donate more, please do. 100% of the money will go to advocating for organ donation and spreading the message. Your T-Shirt will be mailed to you. For you BIG BALLERS, consider $5, $10, or $20 per mile ($65, $130, $260 respectively) as I slug it out mile after mile for 13.1 miles as a giant teddy bear. If you’d like to actually run with me and are already registered in the Houston 1/2 Marathon on January 19th, 2014, just get your shirt via the attached link and email me direct at clutch@rocketball.com and I will coordinate a corral time and meeting place. I would love to have you on TEAM CLUTCH! Got to run;)! GO ROCKETS!!! Thank you to ALL who contributed to this organ donation awareness campaign either with a financial donation or that of your time. This was a very special fundraiser and media stunt that was near and dear to my heart. I am happy to inform you that the donatelifetexas.org official registry surpassed a milestone last week of 5 million registered Texans with only 4.7 million just a short while ago last time I checked in. I’d like to think we had some effect on that. The media generated by TEAM CLUTCH for organ donation was all positive and plentiful. There were stories and interviews that aired on: NBC CH2, ABC CH13, CBS CH11, FOX CH26, CSN Houston, Chinese ITV, 790 Sports Talk Radio, MIX 96.5 with Chad Pitt & The Roula & Ryan Show on 104.1 KRBE! It also made it into the Houston Chronicle’s Sunday paper under Ken Hoffman’s column as well as a staple on rockets.com on the home page for a month. Many of these media outlets ran the stories multiple times and all focused on the benefits to us all concerning organ donation. The total between TEAM CLUTCH efforts and Rockets Community department efforts making Life Gift the charity of the month for January over $15,000 was raised to further the organ donation cause beyond this effort. THANK YOU to all who helped! How was the race “In Full Gear” as Clutch for me??? I’ve been asked this a lot over the past few weeks and I’d like to act tough and macho and tell you that it was no sweat (figuratively of course, not literally…that would just be ridiculous…like running 13.1 miles in a teddy bear costume is not ridiculous to begin with;) I digress. ), but it was NOT! Quite frankly, it was the TOUGHEST THING I’VE EVER DONE! There were times that I thought I might not make it. Then I remembered I promised all of you that I would. That kept me going. Nothing like the fear of complete humiliation and embarrassment to keep you going;) I did not expect it to be that challenging and hard especially after having run 10 miles “In Full Gear” on a treadmill back in October to celebrate 10 years at Toyota Center at a Rockets pre season game. I have since learned that running on pavement and having to be mindful of some 25K+ other runners (all who want well meaning, but completely zone breaking while in a bear costume high fives, fist bumps, and the ever present and intrusive “selfie”) is not the same thing. 13.1 miles while “In Full Gear” is A LOT longer than 10 miles especially when you mentally conceive just how far you are away from the finish line across town when you are struggling as opposed to just zoning out and watching the Rockets play while on a treadmill and letting the numbers on the screen accumulate without paying attention. I started to bonk from lack of calories and dehydrate at about mile 8 since I wasn’t able to shoot the water and sports drink into my mouth very effectively through “my outer mouth”. My bottom half was completely sweat logged by mile 7 and every stride there after was heavy and an annoying sloshing that created some skin irritations. I had to stop for a bathroom break (#1;) & 2 bottles of sports drink downed quickly as possible at mile 8-9ish and that cost me 10 minutes. From there on the “stop demons” were in my head and I started to cramp at mile 11 first in the calves then the hamstrings. I had to walk a few times intermittently which is something I’ve never done in long distance running. All in all it was still a fantastic event and experience. I was rejuvenated along the whole way by thousands of Houstonian’s cheers of encouragement for both me and organ donation. I was honored to have Rob & Janis Heidemann (my father’s donor’s parents) a part of my support team cheering me along the way. I can not put their graciousness into words. THANK YOU! Thank you to all of TEAM CLUTCH for supporting me in this endeavor, but especially Amy Collier, Michael Schnieders, and Dominic Davila who along with me were the first 4 official members of TEAM CLUTCH and helped me get the ball rolling. I finished the race at 2:29:16 which is much slower than my fastest half marathon “NOT In Full Gear” of 1:38:59. Thanks again to Ian Heidemann for his selflessness, forward thinking and generosity of spirit. If he had not made the decision to be an organ donor, my father would not be here today. Thank you to organ donors everywhere and the amazing transplant doctors and medical staff who facilitate these life saving miracles. I had a call with Melissa Devenny who is the managing director of Donate Life America a few weeks back about how I could help further help the cause of organ donation awareness on a national level and more specifically how she put it, organ donation action on a national level (many people are now aware of organ donation these days, but it is more a matter if taking the actual steps to ensure they are officially registered donors). The number one things she asked me to do was not just share my own connection to organ donation and how my whole family benefitted through my Dad’s story, but to share with other beneficiaries of organ donation both direct and indirect the steps I’ve taken to spread the message for the cause and how I did those things in an effort to inspire and help others to do the same. I’ve listed those efforts below. I’ve bold faced the ones I think apply to anyone touched by organ donation regardless of your profession and platform. I hope you find some ideas here to help you spread the word. Melissa also asked me to direct you to donatelifevoices.org so you can share your stories and strategies there too! April is Donate Life Month! Share your stories! Thanks in advance for considering! -August 2012 liked all the social media organ donation pages I could find and interacted with them regularly on an on-going basis. -September 2012 invited as many of my social media contacts to like the organ donation pages I liked as well. -January 2013 from this point on every time I run (3-5 times weekly), I wear my “I RUN FOR ORGAN DONATION AWARENESS donatelifetexas.org” billboard style easy to read while passing seasonal gear (T-shirt, sweatshirt, etc. depending upon whether) and run mostly at Memorial Park at peak hours which is generally trafficked by 1,000+ runners at that time. -July 2013 presented to all NBA mascots at annual conference about organ donation and to please consider using their platforms to influence others. -January 2014 organized & promoted an awareness campaign and fundraiser by running in the Houston 1/2 Marathon as my mascot character of 20 years “In Full Costume” as Houston Rockets mascot Clutch the Bear along with 20 TEAM CLUTCH volunteer runners all in matching shirts (Clutch too) that read, “I RUN FOR ORGAN DONATION AWARENESS donatelifetexas.org” along with matching green donatelifetexas.org head bands. We were a spectacle to say the least! You don’t see too many 6’8” teddy bears with a 92” waist running marathons;). There was live coverage of the race chronicling Clutch’s progress and a live interview at the finish line along with the Heidemann’s who are the parents of my father’s donor (who also served on my support team providing water and sports drinks and cheering with signs along the route). In addition, the cause was spotlighted by stories/interviews done by 6 local TV News programs ABC, NBC, CBS, FOX, CSN, ITV as well as 3 radio morning shows, 2 pieces in the Houston Chronicle, and a month long coverage on the home page of rockets.com. Along with a ton of awareness and hopefully official organ donor registrations, we raised $15K. -FEBRUARY 2014 purchased 10 organ donation novelty T-shirts that convey the message in a humorous way such as, “OF COURSE I’M AN ORGAN DONOR! WHO WOULDN’T WANT A PIECE OF THIS?” from zazzles.com that I wear regularly socially and ran a social media photo promotion with my TOP 10 shirts organ donation shirts posted 10 consecutive days. -March, 2014 Houston Chronicle Profile Piece that focused on Life Gift and my Organ Donation work. -April, 2014 entertained and promoted Transplant Games of America 100 days out event by performing at Nora’s Home event and giving out 10 autographed game worn Clutch gloves “Symbolic Donated Clutch Hands” to first 10 arrivals. -July, 2014 performing and speaking at various events at Transplant Games of America and kicking off the weekend with a media stunt with a mascot bike relay from Space Center Houston to BBVA Compass Stadium where the game’s opening ceremonies are being held. -August, 2014 speaking and presenting “The Full Circle of the Greatest Gift” at a conference along with my father’s donor family, the Heidemann’s, in San Antonio. What a journey it has been these last three years! Surreal, grief stricken, terrifying, humbling, devastating, life changing, overwhelming, awe inspiring, victorious, motivational, purpose driven, and absolutely LIFE SAVING! Since August I have gotten further immersed into the world of organ donation awareness and the business of life saving transplantation. In November I was asked to join the corporate board of directors of Life Gift, a 50 million dollar per year Organ Procurement Organization (OPO), which is 1 of 58 nation-wide. I basically serve as 1 of the 18 volunteer unpaid owners of the non-profit. I was deeply honored and humbled by the invitation that I accepted and began my 3- year term that will run through January 2018 by attending our annual retreat in December 2014. The Todd Krampitz Foundation, a Houston based organ donation awareness non-profit organization, did me the honor of inviting me to join their board. I accepted in January as well, and am excited to role my sleeves up and get busy doing work for them. Rob & Janis Heidemann joined my parents in supporting my 2nd consecutive annual Houston ½ Marathon Run “In Full Gear” as Clutch promoting organ donation awareness. It was a special treat to have Rob and Janis, who we now consider our extended family, be our houseguests during their trip to Houston. The Heidemann’s have taught me with every move they have made and interaction I’ve had with them what true grace is. Words can not describe what it is to watch a Mother and a Father listen to their son’s lungs inhale and exhale inside of your father’s chest with a stethoscope. I will forever consider them family and be in awe of them. The night before the ½ Marathon run in my costume as Clutch, the Houston Rockets bestowed upon me a huge honor and allowed me to create a special surprise moment for Rob and Janis Heidemann. My Parents, Paul & Donna, took Rob & Janis to the Houston Rockets vs Golden State Warriors game that night at Toyota Center as their guests. The Rockets provided me a luxury suite for the two couples to enjoy the game from. When they arrived they were surprised by two of the other lives that their son Ian saved. Reggie King who received Ian’s heart and Rachel Brownhill who received Ian’s pancreas and kidney were both waiting in the suite along with their spouses and members of both Life Gift and Nora’s Home (a home for people from outside Houston awaiting transplantation.) This was the group’s first reunion since October of 2013 when they all met. At the second time-out of the game as a further surprise and to a standing ovation of over 18,500 Rockets fans (the single largest crowd in the 10 year history of Toyota Center) the entire group was acknowledged on the center hung screen explaining the story and connection and most importantly honoring Rob & Janis’s son Ian. I cried in the Clutch costume as I hugged my Dad as he was the last to be introduced and mentioned as my father. The crowd went wild with cheers and tears. It was the single greatest professional moment in my two-decade career with the Houston Rockets. Thank you Rockets for the honor you gave that night and the countless untold for countable lives you saved down the line. For days I received nothing but notes about how moved fans were and how they went home that night after the game and became organ donors via my email and social media. Life Gift’s CEO Kevin Myer contacted me a few weeks later letting me know that their January web traffic had an unprecedented spike upwards of 42%. My wife Amy and I got married on Valentine’s Day, 2015. It was the three-year anniversary of Ian’s passing and my father’s life saving double lung transplant. All four toasts that were made at the wedding by my wife Amy, my father and best man Paul, my brother Paul, and myself, were about Ian and his family. The week after our wedding, my wife and identical twin 6 year old sons made a speech about the power of organ donation at one of the largest high school basketball games in the Houston area. There were over 4,000 people present. A chiropractic doctor, Dr. Miller, who is awaiting a heart transplant himself and is a newly joined Life Gift volunteer, asked me to speak at halftime. I had lost my voice three nights before at our wedding. I delivered the speech in a whisper on the microphone and with the help of an introduction from my wife and closing from my sons. Six year old Jack said, “be an organ donor today”. Six year old Luke ended the presentation with “an organ donor saved my Pop Pop’s life”. Tara Storch, mother of the late Taylor Storch of Taylor’s Gift, reached out to me through common friends and contacts and we became instant friends in February. We have teamed up to promote her event at Top Golf in Spring, Texas on March 27th, 2015 benefiting Taylor’s Gift which can be visited at taylorsgift.org. Their mission is to spread the word about organ donation in Texas and nationally while also providing help and support to donor families left in the wake of immense loss and grief and in some cases financial hardships. I can already tell that my wife Amy & I will be long term friends and allies with Tara and her husband Todd both personally and in our joint effort to get everyone to say YES to organ donation. I will never be able to repay Ian Heidemann’s gifts or Taylor Storch’s gifts, but my mission is to try to inspire as many people as possible the rest of my life to self designate themselves as organ donors and give the greatest gift of all, the GIFT OF LIFE! Visit taylorsgift.org today to link to your state’s organ donation registry to register TODAY! It will take you only 60 seconds and may one day save several lives. An organ donor may even save your life. Ian saved my Dad’s. Here’s to the future! Previous Previous post: Thanks ABC13…and…THANKS HOUSTON!! !